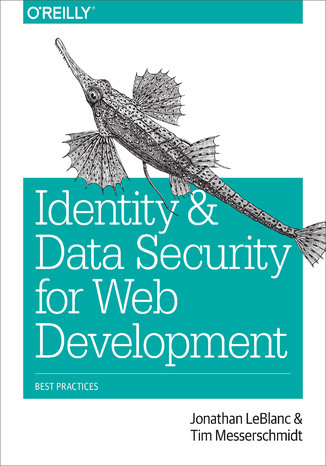 Developers, designers, engineers, and creators can no longer afford to pass responsibility for identity and data security onto others. Web developers who don...t understand how to obscure data in transmission, for instance, can open security flaws on a site without realizing it. With this practical guide, you...ll learn how and why everyone working on a system needs to ensure that users and data are protected.Authors Jonathan LeBlanc and Tim Messerschmidt provide a deep dive into the concepts, technology, and programming methodologies necessary to build a secure interface for data and identity-without compromising usability. You...ll learn how to plug holes in existing systems, protect against viable attack vectors, and work in environments that sometimes are naturally insecure.Understand the state of web and application security todayDesign security password encryption, and combat password attack vectorsCreate digital fingerprints to identify users through browser, device, and paired device detectionBuild secure data transmission systems through OAuth and OpenID ConnectUse alternate methods of identification for a second factor of authenticationHarden your web applications against attackCreate a secure data transmission system using SSL/TLS, and synchronous and asynchronous cryptography Ebook porusza temat Identity. Jedną z istotnych spraw poruszanych w ebooki jest: Security. Jeśli interesuje Cię: Development, to ebook dla Ciebie. Dużo wiedzy na temat: Practices w formacie EPUB, MOBI i PDF. ISBN 978-1-4919-3696-2. Porównywarka cen ebooków, które dostępne są w formatach PDF, MOBI i innych. Na urządzenia Kindle i inne. Tutaj znajdziesz ebook, którego szukasz. Nie wszystkie ebooki w ofercie są darmowe. Wspierajmy autorów i kupujmy ebooki.